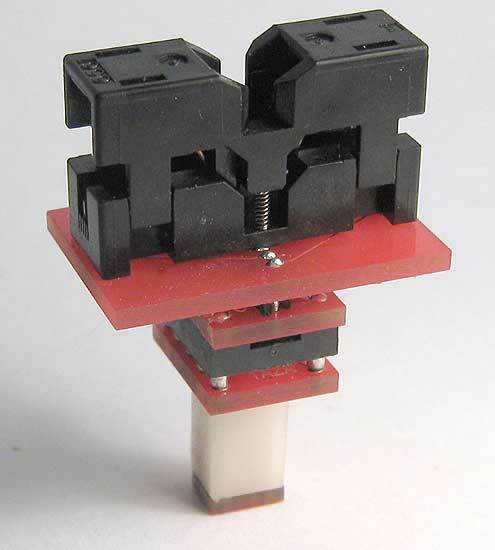 This is a two part adapter kit providing a way to temporarily plug SMT surface mount components to a circuit card under test. The bottom part (SMT base), is surface mounted to the PCB and replaces the component normally soldered to the PCB card solder pads. The top part plugs into the SMT base and has ZIF socket to hold the SMT component. Adapters are listed in ascending pin count order. 8SO15-SO-ZO-SD ZIF open top socket to SMT pads for 8 lead SOIC package. Also fits similar SMT bases for 153, 170, 208 and 300 mil wide bodies. 8SO17-SO-ZO-SD ZIF open top socket to SMT pads for 8 lead SOIC package. 8SO21-SO-ZO-SD ZIF open top socket to SMT pads for 8 lead SOIC package. Also fits similar SMT bases for 153, 170, 208 and 300 mil wide chip bodies. 10D3-SSOS17-SD 10 Pin DIP socket to SSOS pads. 10SS0-SO173-ZO-SD ZIF SSOP open top socket to SMT pads for 10 lead SOIC package. Also fits similar SMT bases for 153, 208 and 300 mil wide chip bodies. 14SO15-SO-ZO-SD ZIF open top socket to SMT pads for 14 lead SOIC package. Also fits similar SMT bases for 173, 208 and 300 mil wide chip bodies. 14SO17-SO-ZO-SD ZIF open top socket to SMT pads for 14 lead SOIC package. 14SO21-SO-ZO-SD ZIF open top socket to SMT pads for 14 lead SOIC package. 16SO15-SO-ZO-SD ZIF open top socket to SMT pads for 16 lead SOIC package. 16SO15E-SO-ZO-SD ZIF open top socket to SMT pads for 16 lead SOIC package. 16SO17-SO-ZO-SD ZIF open top socket to SMT pads for 16 lead SOIC package. 16SO21-SO-ZO-SD ZIF open top socket to SMT pads for 16 lead SOIC package. Also fits similar SMT bases for 153, 173 and 300 mil wide chip bodies. 16SO30-SO-ZO-SD ZIF open top socket to SMT pads for 16 lead SOIC package. Also fits similar SMT bases for 153, 173 and 208 mil wide chip bodies. 16SO30-SO-EZO-SD ZIF open top socket to SMT pads for 16 lead SOIC package. 20SO21-SO-ZL-SD ZIF clamshell closed top socket to SMT pads for 20 lead SOIC package. 20SO30-SO-ZO-SD ZIF Open top socket to SMT pads for 20 lead SOIC package. 20SO30A-SO-ZO-SD ZIF Open top socket to SMT pads for 20 lead SOIC package. 24SO30A-SO-ZO-SD ZIF Open top socket to SMT pads for 24 lead SOIC package. 28SO30-SO-ZO-SD ZIF Open top socket to SMT pads for 28 lead SOJ package. 28SO30A-SO-ZO-SD ZIF Open top socket to SMT pads for 28 lead SOIC package. 32SSOS30-SSOS-ZO-SD ZIF Open top socket to SMT pads for 32 lead SOIC package. 32SO30A-SO-ZO-SD ZIF Open top socket to SMT pads for 32 lead SOIC package. 32SO42-SO-ZL-SD ZIF Closed top socket to SMT pads for 32 lead SOIC package. 32SO42A-SO-ZO-SD ZIF Open top socket to SMT pads for 32 lead SOIC package. 32SOJ40-SO-ZO-SD ZIF Open top socket to SMT pads for 32 lead SOIC J-lead package. 40SO42-SO-ZO-SD ZIF Open top socket to SMT pads for 40 lead SOIC package. 40SO45-SO-ZO-SD ZIF Open top socket to SMT pads for 40 lead SOIC package. 44SO50-SO-ZL-SD ZIF clamshell closed top socket to SMT pads for 44 lead SOIC package. EMAIL your chip package drawing and/or device part number to assure the mounted socket matches. 44SO51-SO-ZL-SD ZIF clamshell closed top socket to SMT pads for 44 lead SOIC package. 44SO52-SO-ZL-SD ZIF clamshell closed top socket to SMT pads for 44 lead SOIC package. 44SO53-SO-ZL-SD ZIF clamshell closed top socket to SMT pads for 44 lead SOIC package. Aprilog is a Division of Enable Engineering Co., Inc.